The DJS Team Grows Again! We have recently been involved in two large tender and procurement processes for Severn Trent Water and The British Council. They rated the company on our finances, resources and our ability to deliver high quality research projects. 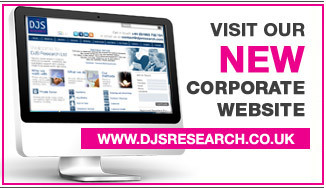 DJS Research Ltd was one of 50 companies selected that will now receive a package of support for the next 12 months. The programme is designed to help us overcome barriers to growth and capitalise on existing strengths. Simon Hall, Programme Manager for Coaching for High Growth said â€œWe have had a fantastic response and we are really looking forward to working with these ambitious and progressive businesses to help them realize their growth aspirationsâ€. During July 2010, DJS Research Ltd was pleased to welcome two year 10 students, Thilina Prathapasin and Jordan Murphy, into its Whaley Bridge offices to take part in the companyâ€™s inaugural work experience scheme. The company has experienced an exceptional year of growth with turnover now very close to the Â£1 million mark. In addition to the new staff below, we would also like to welcome Sarah Smith who joins us from Conquest Research and will be part of the team from July. To help with the continued growth of our company, we are actively recruiting and looking for further experienced researchers to join the team (Ideally at Senior Research Executive/Research Manager Level) If you would like to work within a small, exciting and growing agency, please do get in touch. Please note we are not currently recruiting in Canada/USA or anywhere outside of the UK (see news item below). Please note we are not currently recruiting within Canada/USA or anywhere else outside the UK. If you see a job posted on Craigslist or similar sites it is not genuine. DJS Research Limited would never ask potential job applicants for any payment. St Helena is one of the most remote islands in the world and is currently only accessible by sea. Earlier this year, the British government postponed plans to build an airport on the island, and thus they face a real challenge in attracting investment to the Island. DJS Research was approached to help understand how the Island could attract retirees. Results from the study have shown that the climate and beauty of the island, as well as its relaxed pace of life, appealed to UK retirees, although as expected many were concerned by the limited access to the island. However, a clear niche was identified who found this limited access appealing and were less concerned about the practical issues. Linda Houston, Managing Director, SHDA, comments: â€œI am delighted with the work DJS Research has done on this project. The final report has given us great insight into the potential retirement market here in St Helena. â€œDJS provided us with a highly professional, courteous service, which delivered the results on time and to budget. What's more they did it with flare and in a way which was totally appropriate for the clientele. We have recently been involved in a large tender and procurement process for OFWAT. It rated the company on its finances, resources and our ability to deliver high quality research projects. In addition, in two of the above categories, we were ranked first compared with other approved suppliers. Companies on the roster will be called upon to conduct a wide range of market research and customer insight work. As well as OFWAT, the framework can also be utilised by other Central Government Departments, their agencies and Non-Departmental Public Bodies (NDPBs). Over the last year, this is the third Government procurement programme that DJS Research Ltd has successfully been selected for. We'd like to take this opportunity to say thank you very much to all of our clients and suppliers for your continued support throughout 2009 and here's to a prosperous 2010! "DJS took our initial brief, prepared the proposal and question framework then carried out the job in the most seamless fashion. I do believe it is the slickest, most professional engagement I have ever had with a 3rd party company in my 20 year career in sales and marketing. Simply seamless!"